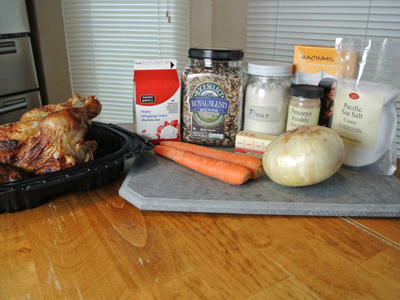 I chose to use rotisserie chicken meat which is perfect for soups and saves on time and effort. You can use other vegetables here, but I went with onion and carrots. 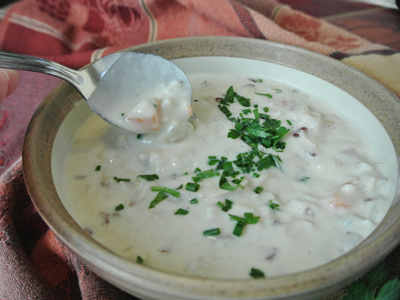 Other ingredients include wild rice, butter, flour, chicken stock, water, salt and pepper. 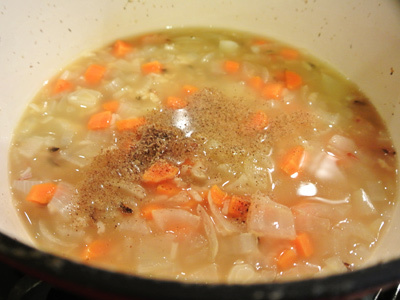 In a dutch oven heat a box of stock along with the chopped carrots and onions. Bring just to a boil. Add the wild rice to the pot. 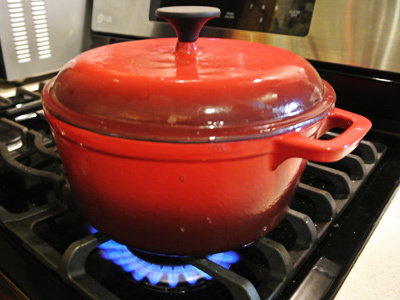 Set the lid in place, turn down the heat and simmer for 15 minutes. After the 15 minutes of simmering on the stove, the rice should be cooked and the carrots fork tender. Salt and pepper to taste. Mix 2 cups of water with 1/2 cup of flour. 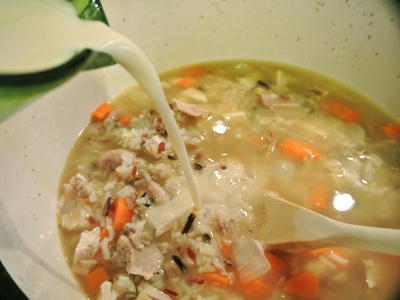 Whisk together, then pour into the pot of soup. This will serve to thicken the soup. Next comes 2 cups of heavy cream. 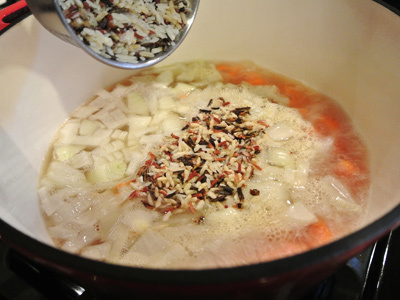 Stir the soup over low heat. 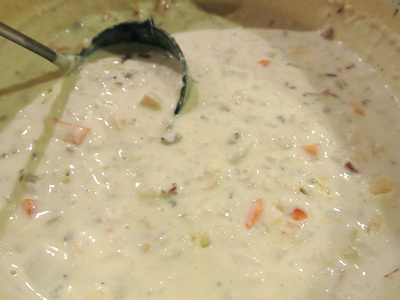 Add 4 tablespoons of butter to melt into the soup to make it taste oh so good! Serve with a sprinkle of parsley. 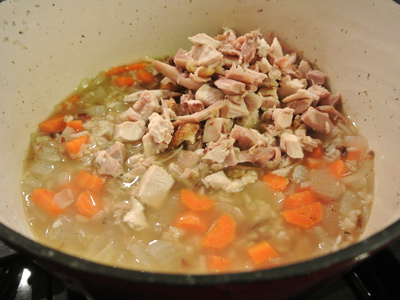 In a dutch oven over medium high heat, stir together chicken stock, carrots and onion. Stir in the wild rice, place the lid on top and reduce the heat to simmer for 15 minutes. When rice is cooked and carrots are tender, add salt and pepper to taste. Add the chopped chicken and stir the pot. 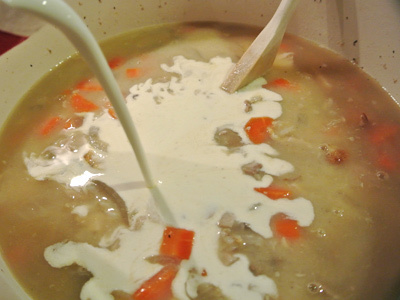 Whisk the water and flour together then add to the soup. 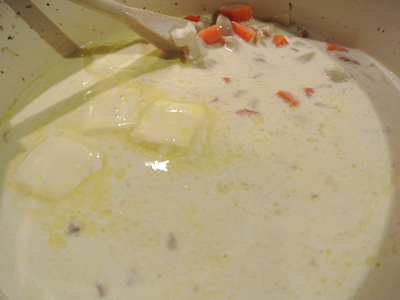 Add the heavy cream and unsalted butter to the pot, stirring until the butter has melted. 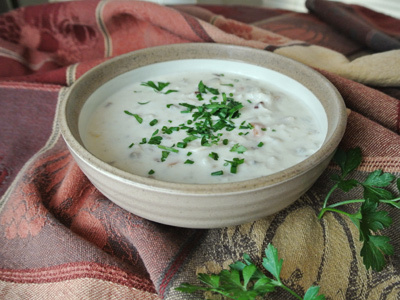 Serve soup warm with a sprinkle of parsley. 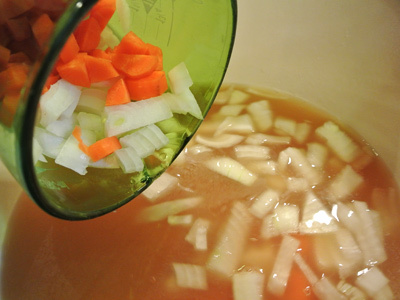 Note** Any leftover soup may be too thick the next day, stir in a bit of water to thin it back to the desired consistency. This looks great! I will have to try it on one of our blizzard days…that just means as a Canadian, I can make it a lot! Thanks! 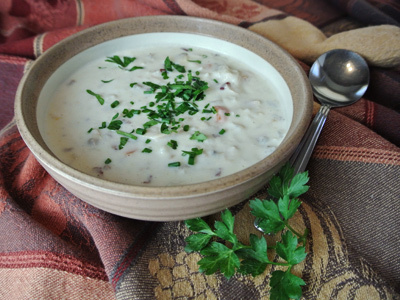 Enjoy the soup and stay warm this winter up in Canada! btw, could i called this risotto or porridge?? i guess who bother about it, it just simply delicious! Thanks, it is very thick so maybe porridge would be a good description! Thanks Anne, hope you had a wonderful holiday!